By now you’ve downloaded the Veryfi Logbook Mileage Tracker and created an account or logged in with your existing account. The app guided you through creating your first vehicle. So now what? There are a few things that need to be configured correctly in the app to ensure you get the most out of it. The most important setting to get right is the reimbursement rate. Veryfi Logbook Mileage Tracker will work anywhere in the world as long as it’s set up correctly. 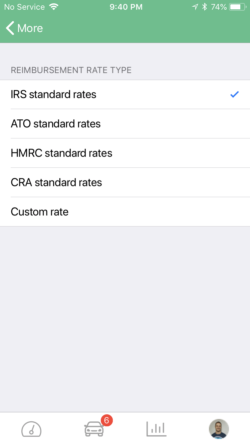 For users in the United States, Canada, Australia and United Kingdom, the app can be configured with the standard reimbursement rates that are defined by each country’s taxation office (IRS, CRA, ATO and HMRC, respectively). In these countries, the reimbursement rates can be somewhat complicated. For example, in the U.S., business miles are reimbursed at one rate while miles incurred for charitable duties are reimbursed at a different rate. 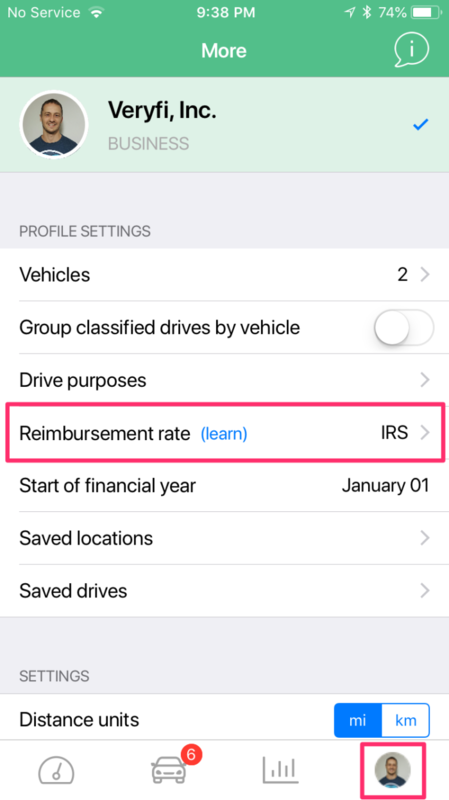 In Canada, UK and Australia, there are different reimbursement rates depending on how many miles (or kilometers) were driven throughout the tax year. U.K. also offers different rates depending on the type of vehicle driven. Rates are also revised before the start of each tax year. The Veryfi Logbook Mileage Tracker has you covered for all the various scenarios in these countries. But if you’re in a country outside of the U.S., U.K., Canada or Australia, or if your reimbursement rate is dictated by your employer, a “Custom rate” option is available. This can be set to any amount per mile or kilometer. When the app is first installed, it comes pre-configured with a list of “Business” and “Other” drive purposes. These lists are sufficient to cover all typical purposes and are appropriate to use when claiming tax deductions. Of course, there may be a good reason to extend these lists to include more granular or more appropriate drive purposes. To add a new purpose, tap on either “Create new Business purpose” or “Create new Other purpose”, then type the name of the new purpose and tap “Done”. That’s it! 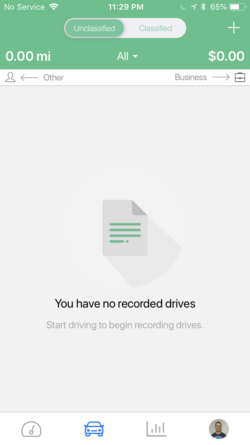 Custom drive purposes (those you added yourself) can be deleted by swiping left of that purpose and then tapping the “Delete” button that appears. Drive purposes can also be rearranged so that your more commonly used purposes appear in a position that’s more convenient for you to find and select when classifying drives (we’ll discuss classifying drives soon). 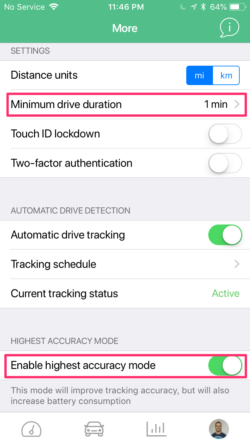 The final (and perhaps most useful) point about drive purposes is the “default” drive purpose. If you find yourself choosing one specific Business and/or Other purpose, it would be a great idea to set that purpose as the default. This will minimize the time you spend on classifying drives. 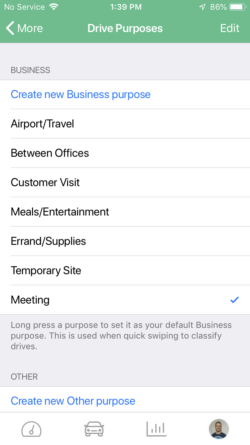 To set a purpose as the default, simply tap on that purpose and leave your finger there until you see a check mark appear on the right side of the purpose name (as seen in the image above next to “Meeting”). To change the default purpose, simply long press a different purpose. To remove the default purpose, long press the purpose that is currently set to default. Remember to do this to both the Business and Other lists, if applicable. There are other settings in the app that you can explore as you get comfortable with it, but for now we have covered the two main settings to ensure an accurate logbook. The next thing we’ll cover are the best practices for recording drives. 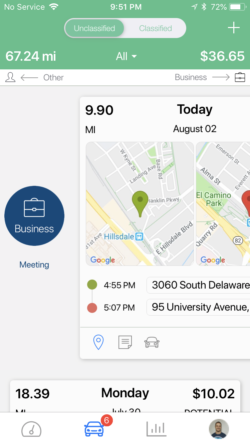 Veryfi Logbook Mileage Tracker uses your phone’s GPS and motion sensors to detect when you start and finish drives, along with keeping track of the route. When the app is terminated on your device, there’s a limit to the accuracy of the data that it can get from these sensors. We highly recommend that you keep the app running in the background at all times. This will ensure the most accurate tracking of your drives. 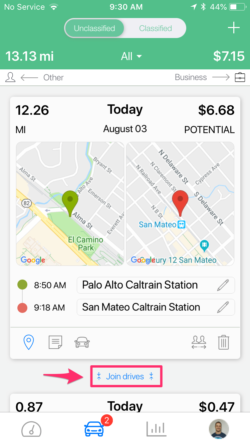 When creating Veryfi Logbook Mileage Tracker, it was important to us to keep battery usage very low while still maintaining a high level of accuracy, and this is exactly what we’ve achieved. There are circumstances, however, when the app requires faster battery consumption in return for higher degrees of accuracy. Usually this is only required for frequent short trips (between 1 and 10 minutes of drive time). In such circumstances, it can be very helpful to enable “highest accuracy mode”. To ensure that short drives don’t get ignored, also make sure that “minimum drive duration” is set to 1 minute. You’re now ready to start recording your drives. All you need to do is keep your phone with you as you drive and let the app do its magic. 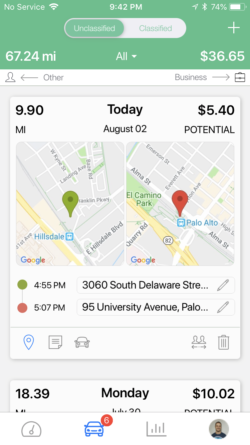 Each drive you complete will appear in the app 10 to 15 minutes after you stop driving. This brief delay is to make sure that you’ve really completed the drive, as opposed to being stuck in traffic. As you go about your day, the drives you make will start appearing in the Unclassified drives section of the app. At this point, there’s only one thing left to do: Classify your drives. Classifying your drives is as easy as a swipe. Swipe right for Business and left for Other. 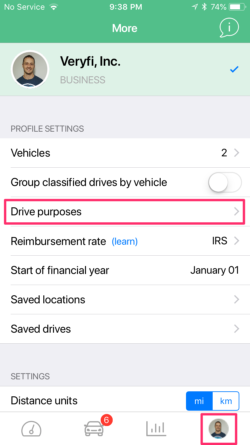 If you don’t have default purposes configured (see the “Drive Purposes” section above), you will be presented with a list of the relevant purposes to choose from. If you do have default purposes configured, doing a short swipe will classify the drive as that default purpose. 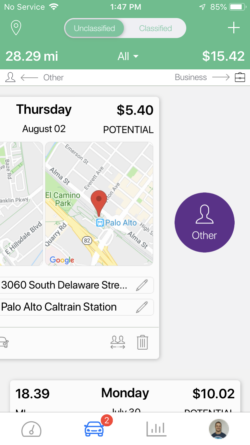 Doing a longer swipe will bring up the full list of drive purposes to choose from. Once classified, your drives will move from the Unclassified to the Classified view. 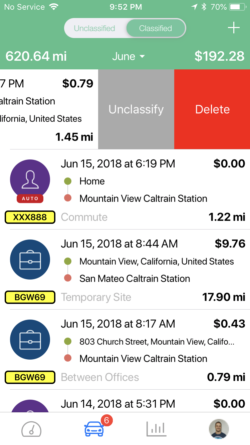 In the classified view you can either tap on a drive to view and/or alter a drive’s details (such as reclassifying to a different drive purpose or changing the vehicle recorded against the drive), or you can swipe the drive to the left to reveal the options to unclassify or delete that drive. 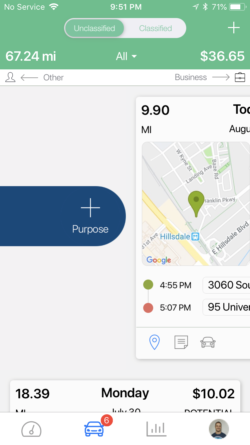 As mentioned earlier, once you haven’t been driving for 10 minutes or so, the app considers the drive complete and will add it to your list. If you’d like to ignore short stops and join multiple drives into one longer one, simply tap the “Join drives” button in between the drives you want to join. What happens if your drive is missed? Maybe your phone battery died or you didn’t have the app open when you made a trip. You can still add your missed drives manually. Simply tap the “+” icon in the top right of the drives section and enter all the relevant details.